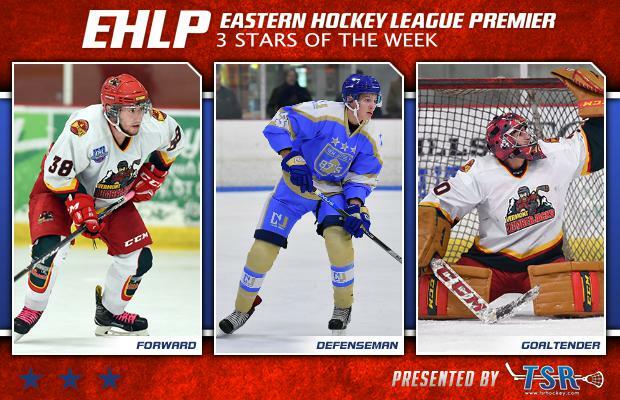 BOSTON, MA -- In the final weekend of play before the Thanksgiving break, the Eastern Hockey League Premier (EHLP) featured 12 of the 13 teams in action and plenty of worthy candidates for our weekly honors. 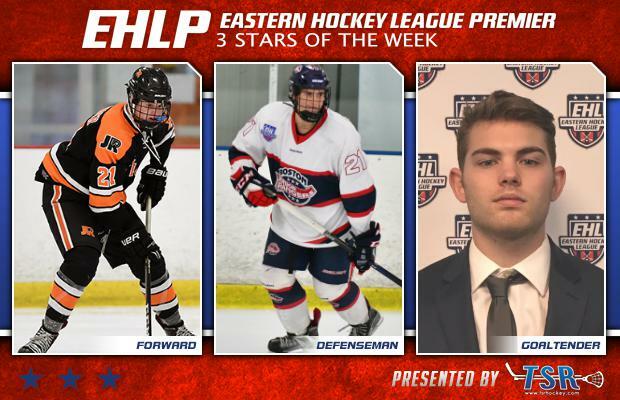 The EHLP is pleased to announce that Ben Meisinger (Philadelphia Jr. Flyers), Cam Roberts (Boston Jr. Rangers), and Jon Szynalski (New Jersey 87s) have been named the TSR Hockey Stars of the Week. Following the weekend action, the game schedule becomes very quiet due to Thanksgiving on Thursday. There are three total games on the schedule next weekend, with the rest of the EHLP teams set to return to the ice the first weekend in December. The next set of TSR Hockey Stars of the Week will be released on Monday, December 4th at 4:00pm. Catch the EHLP action all season long on HockeyTV. Meisinger and the Jr. Flyers won both of their games this past weekend against the Central Penn Panthers, scoring 23 goals in the process. On Saturday, Meisinger scored the first Jr. Flyers goal of the game in route to a 10-4 victory. The next day, the 2000 forward racked up 8 total points in a 13-4 win, with a hat-trick and five assists. With the nine point weekend, Meisinger now has a total of 24 points on the season with ten total goals. The 1st place Jr. Flyers will enjoy a nice holiday break before hosting their division rival Philadelphia Little Flyers on December 3rd. Roberts and the Rangers took care of business this past weekend with a pair of wins against two divisional rivals. The '99 defensemen picked up an assist in their 5-2 win against the Walpole Express on Friday, then collected two more assists the next day against the New England Wolves. After this weekend Roberts leads all defensemen on the Rangers in the assist category with 12 on the year. After the holiday break, the Rangers will spend the weekend in Burlington with a three-game series against the Vermont Lumberjacks. The 87s won all three of their games last week and Szynalski was between the pipes for two of the victories. On Saturday, the '97 goaltender made 23 saves in the 6-3 win against the New Jersey Renegades. One strong game for Szynalski led into another, when the netminder stopped 24 out of 25 shots in his team’s 5-1 win over the Philadelphia Little Flyers on Sunday. With the two wins this past weekend, Szynalski brings his record up to 6-6-0 on the season with a solid 3.06 GAA. Up ahead after the holiday break, the 87s will travel to the Revolution Ice Gardens for a pair of matchups with the Philadelphia Revolution. The EHLP would also like to recognize an honorable mention this week, which goes to Jeff Carp of the Philadelphia Revolution. The 2000 defenseman collected three assists in his team's 3-2 win against the New York Applecore on Saturday night.